HappyGoLucky. That’s the name of your horse. Let’s say it’s the early 1900’s, and you’ve got a big race coming up. The problem is, HappyGoLucky is kind of jumpy before the big day. What do you do? The solution? 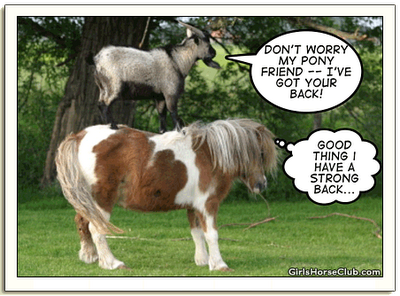 If you put a goat in the stall with your horse, it’ll calm him right down. That’s right, a goat. Now here’s where things get nasty. Sometime during the middle of the night, someone breaks in and gets your goat! That means HappyGoLucky isn’t so happy come race time. He’s shaky and nervous! ARGGGGGHHHH! Who Got Your Goat? Believe it or not, this is (according to several websites) the probable origin for that strange phrase. There’s no way to know if it’s really true or not, but the description seems accurate for my life. I’ll be feeling HappyGoLucky, and then some annoying person gets my goat, leaving me all unsettled. Who gets your goat? The person that gets mine may not be the same as the person who gets yours. Maybe you have a personality conflict. Maybe they remind you of someone you’ve had issues with in the past. Maybe you can’t figure out what it is about this person that gets your goat, but it behooves you (get it?) to do something about it. 1) Better security. You can try to play it safe. If you’re paying better attention to your boundaries, you might not let as many goat-thieves near you. Still, if you’re too isolated you’ll never find your way out of the gate. 2) More goats. You can practice safety in numbers. There may be some goat-getters you can’t avoid. But if you’re surrounded with people and things that keep you calm and centered, someone could get a few of your goats but you’d still be ready for the big race. 3) Confront the thief. If someone gets your goat on a regular basis, maybe it’s worth talking to them. You don’t have to start an argument or explode in anger, but sometimes you may have to be honest. You may just need to get to know each other better, develop some respect and trust of each other. Who knows? You may have been getting a few of their goats without knowing it. Life is an important race, and you don’t want to let anybody else cause you to stumble. At the same time, lots of goat-stealers do so unintentionally. Perhaps they’re just awkward. Perhaps you’re being too sensitive. Whatever the case, you’ve got a journey ahead of you, and you want to minimize the number of times you stumble. I’ve got my money on HappyGoLucky. 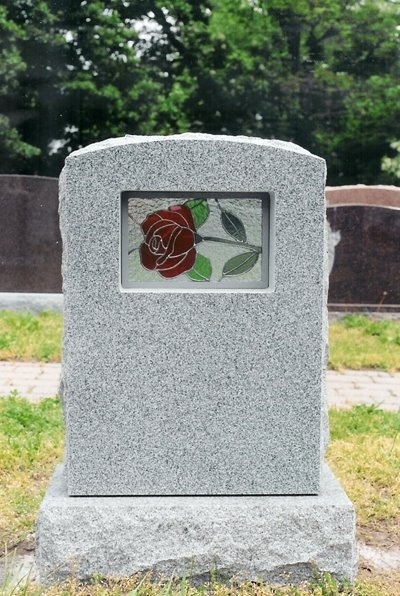 What DON’T You Want On Your Tombstone? As uncomfortable as most of us are talking about our own mortality, mightn’t it be a good idea to reflect on how you want to be remembered when that day comes? That’s a toughie. Maybe the better question to ponder is how you don’t want to be remembered. What is there about you that you don’t necessarily want to be remembered for? In other words: What don’t you want on your tombstone? Clever! It sounds like a compliment at first, but at second thought, what kind of life would that describe? Jokes and guffaws signifying nothing? If all I ever amounted to was clever, would that mean I never had something of substance to say? Would that mean I never really did something with my life? You get the idea. Clever, for me, could point to a life without the depth of faith that I aspire to. That might be one way to describe me, but I wouldn’t want that to define me. What about you? 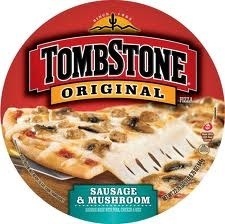 What don’t you want on your tombstone? Can you think of an aspect of your life that some might think is a defining characteristic, but only scratches the surface of who you are? Maybe you’re quick to act but want to be remembered for your thoughtfulness. Maybe you’re a trend setter but you’d like to be remembered for being a strong role model. Maybe you’re a great cook, but you want your legacy to be your advocacy with children. I don’t know the ways people maybe aren’t seeing you the way you want to be seen. And frankly, we don’t always get to choose other people’s perceptions of ourselves. But if we’re clear about what we don’t want to have seen as our leading edge, we might find some motivation to chisel out the life we want to be living. Well the bad news is, you really are gonna die some day. That’s how life works. But the good news (aside from the whole Heaven thing) is that between now and then you have the opportunity to shape your life into something more lasting than any tombstone. Perhaps you needn’t worry so much about your epitaph. After all, a few words could never sum up your life. Who’s gonna play you in the movie? 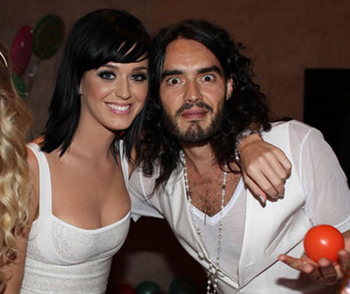 RUSSEL BRAND AND KATY PERRY ARE GETTING DIVORCED! I notice the headlines on the supermarket tabloids, and I wonder at the useless information I carry inside my head. I know how many days Kim Kardashian was married, even though I couldn’t pick her out of a lineup. I can name 3 of Madonna’s exes without looking: Guy Ritchie, Sean Penn, and Warren Beatty. Oh, and Dennis Rodman. There’s four. WHY DO I KNOW THIS? I check online and discover that Russel Brand and Katy Perry are getting divorced. Another couple? It’s almost like an epidemic. We see it so often we can become desensitized to it. But that would be a mistake. I have to believe that there aren’t many people in this world — including celebrities, who take something like divorce lightly. Often there are children involved. Real emotions. Pain. Divorce is not something to be taken trivially. Divorce is the dissolution of a covenant, and God is big on covenants. God has made the same covenant with us, time and time again throughout history. God will be our God, and we will be God’s people. And in all that time, even when we failed to uphold our part of the bargain, God has stayed with us. Through thick and thin. Apparently, that’s something Russel and Katy weren’t able or willing to do for each other. I actually feel for them, and all celebrities, who have their dirty laundry aired for all to see. I suppose some thrive on the publicity, but brokenness is brokenness, no matter who is involved. A failed marriage covenant is not water cooler material. It’s a reason for real sadness. But it’s not the end of love. You know people who are divorcing, or have long since been divorced. Maybe you’re one of those people. I believe that even when a couple cannot continue in marriage, God is working to move all those involved towards wholeness. Russel, Katy, Guy, Madonna, even Kim Kardashian and Kris Humphries, they all have the benefit of God’s unending love to move them in healthier directions. Of course, that’s not the story the tabloids are telling. They speak of prenups, and affairs, and scandal, and hurt. For some reason, that’s the stuff so many of us want to read about. Do you think it’s arrogant to name a city after yourself? David did it. In the scriptures, Jerusalem is referred to as the City of David. I’ve been there. I’ve staked out a few times and places like that. Everything comes together. My job is great. My relationship with God is strong. I’ve got friends and family, and no worries, and lots of good times, and plenty of comfort. Those are great times. Like I’ve got the key to my own city. The City of Mitch. And like David, I’ve found myself saying similar words at a time like that: “The world is firmly established; it shall never be moved.” Yes! Everything is JUST RIGHT here in the City of Mitch. The weather’s nice. The economic forecast is high. No major injuries reported. Just look at my skyline! And then…something changes. For David, he must have gotten bored. His eye began to wander, and he fell for the lovely Bathsheba, who was already another man’s wife. Funny, he wanted his world to never move, but then he went and gave it a big shove in the wrong direction. The City of David became a seedier town to live in. For Mitch? A wonderful holiday, time for relaxing, little to worry about, and then…back into the office. A mound of letters to sign, calls to return, devotions to write. Same city, but a lot more activity in the business district. Funny thing – I was ready for it. Ready for The City of Mitch to undergo some New Year’s renovations. No major earthquakes, at least not so far, but the truth is, no city is impervious. My world keeps being reestablished again and again and again. Life has its high moments and its low moments. Kingdoms rise and fall. But you know what? If you put God at the center of your city, the way David did, the way I try to, the constant contact of God almighty will never leave town. I don’t know how you’re feeling on this early January day — maybe you feel like they should name a city after you, or maybe you feel like you’re sitting in ruins. 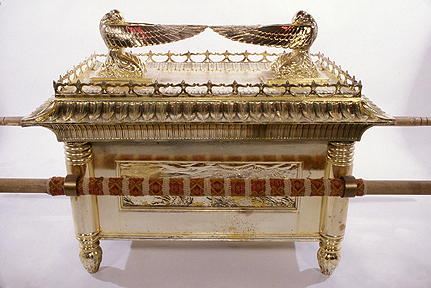 The Ark of the Covenant may not be in a tent in the middle of your town, but the covenant is still with you. God will be your God for now and ever, and that’s not gonna change. Even if your skyline does.